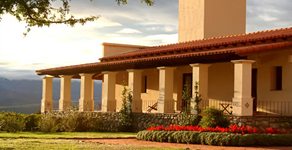 Viñas de Cafayate is an imposing Wine Resort located 3 kilometers from the center of Cafayate city in Salta. 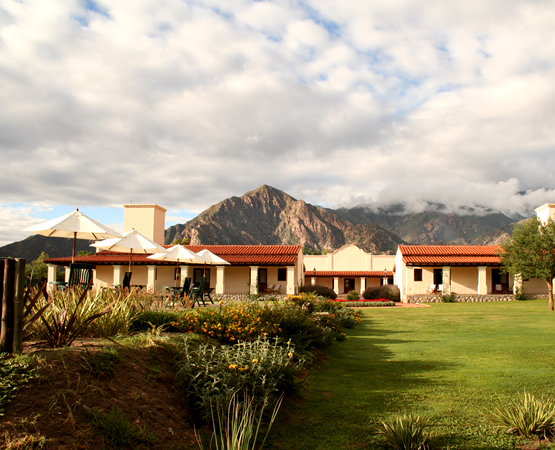 An unique place where dominates the contact with nature and the wine-producer tradition of Salta. It was built in the middle of a vineyards farm and to the feet of San Isidro hill. The resort chas a magnificent living room with firewood and library, TV LCD 32 inches, DirectTV and DVD. Recently the works in the Cava have been finished, where guest will be able to taste the best wines of the region, especially selected. We have a model organic garden for the provision of the kitchen of the resort. 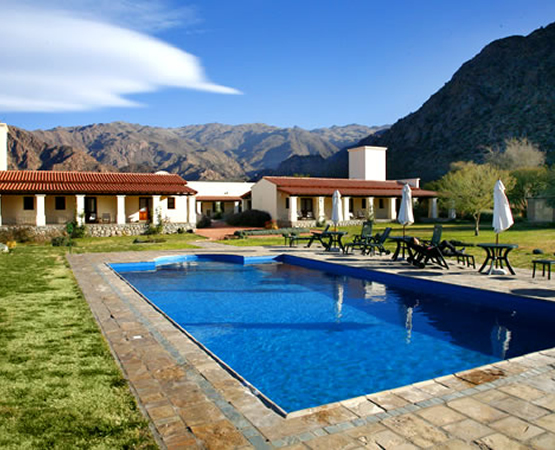 The guests will also be able to enjoy the swimmingpool and an extensive solarium with panoramic views of the vineyards and Cafayate. The wine resort has also a regional gourmet restaurant for guests but also for the general public. * Internal colonial Patio (backyard). * Medical emergency 24 hs. The Wine Resort has 12 double rooms (with twin or queen size beds), triple and single. Breakfast is included. All rooms have a private bathroom with a bathtub, a walk in closet, heating and safe-desposit box. Standard rooms have a sitting room with an armchair, while deluxe rooms have air conditioning. 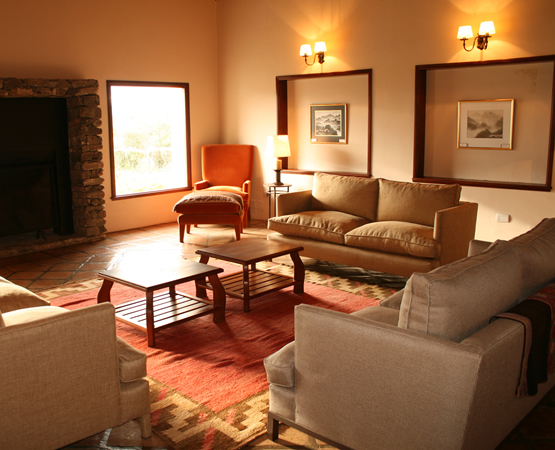 The rooms have access to a spacious covered balcony overlooking the vineyards, granite hills, and Cafayate Canyon. 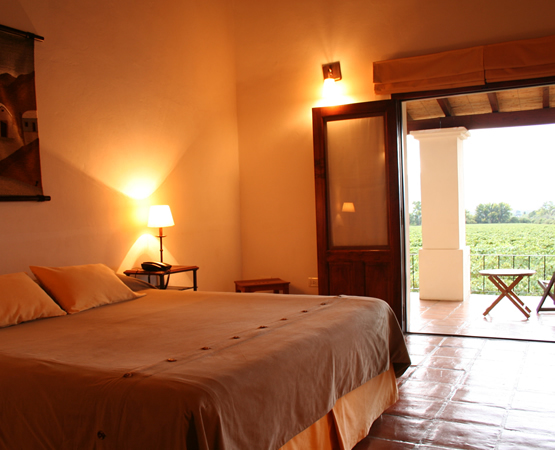 The wine resort is located inside the Calchaquí Farm surrounded by its own torrontes grapes vineyards. It has a wine cellar where guests are able to taste the best wines of the region, especially selected. In a close future the Wine Resort will lauch its own limited production of wines from its vineyards. shops and premium wineries such as Finca Las Nubes de José Luis Mounier or El Porvenir. Hike across Calchaquí Estate where the wine resort is located and visit to its vineyards. * All-day excursions to La Viña-afarm located in the middle of Flecha Canyon with plantations of Tannat grapes. The Wine Resort is located in the city of Cafayate, 1,86 miles away from the main square, on 25 de Mayo St., on the way to the Divisadero. 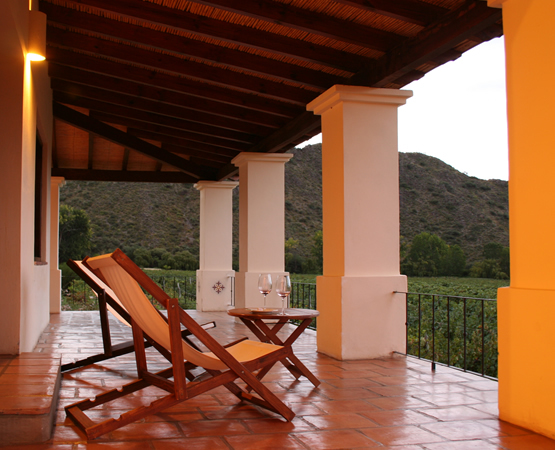 It was built amidst a vineyard plantation at the foot of the impressive San Isidro Hill. By plane: a two-hour flight from Buenos Aires. By car: a two-and-a-half drive from the city of Salta and a three-hour drive from the city of Tucumán.